> Organic farming: A recipe for success? Transboundary Biodiversity Conservation (TBC) is not a recent concept: The first conservation area straddling the border of two nations, Virunga National Park (formerly Albert National Park), was created by the german colonial administration in 1925 on the border of Congo and Rwanda. However, due to the recent impetus in promotion efforts by international organisations such as the World Conservation Union (IUCN) and the International Tropical Timber Organisation (ITTO), TBC as an approach to management and governance of borderland resources is gaining significant importance in international cooperation for biodiversity conservation. International cooperation in TBC aims to extend protection of natural habitats beyond the border of each cooperating country. 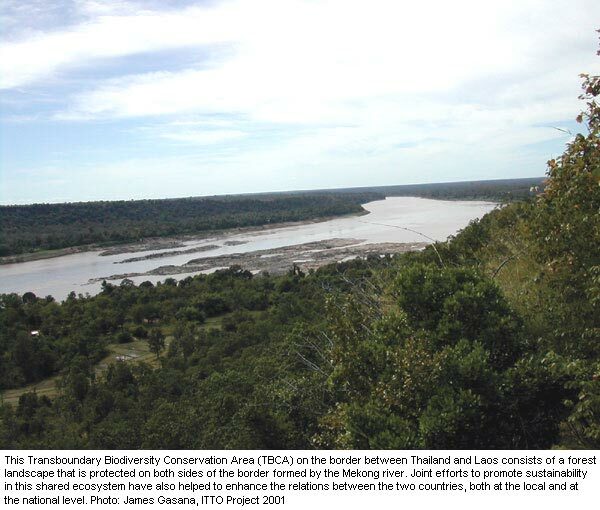 The objective is to establish Transboundary Conservation Areas (TBCA) that allow each party to have an important extension of their protected area on their neighbour's territory put under a matching biodiversity conservation effort without incurring additional costs for its protection and management. TBC distinguishes itself from other concepts by its methodological approach, in which landscapes and ecosystems form the basis of conservation management. Furthermore, unlike other concepts, TBC aims to initiate processes that mobilise cross-border relations in an effort to support the goals of biodiversity conservation. Goals, perceptions and interests of national governments, sub-national and local governments, local communities, public and private institutions, NGOs, and particular individuals diverge whenever conservation decisions must be taken on a given TBCA. TBC projects must take this diversity into account and ensure that an integrative process takes place. Objectives cannot be achieved by simply enhancing binational programmes with joint activities. TBC projects must also encourage the development of binational strategies to promote pluralism of actors within a flexible network addressing a broader range of issues. All integrative efforts must be rooted in the political will of two or more participating countries to recognise the existence of mutual transboundary interests, the need to establish coherence in the management practices of their respective adjacent conservation areas, and their interdependence in problem solving. Embedded in the TBC approach is the recognition that stakeholder interaction is mutually beneficial and promotes conservation as well as other directly or indirectly related interests. These may be tangible or intangible and can concern issues such as socio-economic development, cultural and biodiversity values, promotion of peace and good neighbourliness, and security. In Thailand, the Pha Taem Protected Forests Complex (PPFC) requires crossborder cooperation with Laos and Cambodia in matters of biodiversity. ITTO initiated a project in 2001 to combat cross-border poaching and trade in plant and animal parts, forest encroachment for agriculture, lack of management capacity, and presence of landmines. However, the project will only be successful if the local communities can benefit from it and can thus be convinced to pursue the objectives. > ITTO Tropical Forest Update, Vol. 13, No. 2, 2003. 31p. The FAO has examined the impact of AIDS on agriculture, based on several case studies conducted in Namibia, Uganda and Zambia. The results point to three main problems that are closely interlinked. First of all, AIDS lowers productivity, as means of production are sold to cover the costs of illness, and workers and knowledge are lost. Secondly, widows of AIDS victims often lose their possessions to the deceased husband’s relatives. A third effect of AIDS is the increasing number of orphans, who are usually taken in by relatives and thus become an additional burden on household budgets. These problems lead to marginalisation of the affected population groups. They are often unable to participate in agricultural reform programmes. According to the FAO study, the following measures can help improve the situation: AIDS-specific advanced training for agricultural extension workers, building public awareness of the interconnections between AIDS and agriculture, improving the food situation of affected households, and securing women’s property rights. On the governmental level, the study quotes multisectoral cooperation and integration of AIDS into development agendas as important objectives. The COP-9, held in Milan from 1st to 12th December 2003, brought together government representatives, observer states, NGOs and the media. It adopted resolutions on the modalities for including forestation activities under the Clean Development Mechanism; good practice guidance on landuse, land-use change and forestry; the Special Climate Change Fund; and the Fund for Less Developed Countries. In the framework of the Kyoto Protocol, the Clean Development Mechanism aims to help “poor“ countries achieve sustainable development and to contribute to the ultimate objective of the Convention, as well as to support industrialised countries in meeting their quantified emission-reduction targets. Yet, the official negotiations remained deadlocked on several issues, particularly the mechanism to fix CO2 levels. The issue of climate change is still high on the agendas of NGOs and the academic community, proof that in spite of the lack of significant progress, vigorous efforts to address the adverse effects of climate change are gaining momentum. In the past decade, Africa has seen numerous more or less successful efforts to decentralise governmental power and to organise administration and management of land locally. In May 2001 Tanzania blazed the trail by enforcing its Village Land Act, a law designed to transfer authority over land administration and management to the communities. The Village Land Act places particular emphasis on integrating traditional customary rights and protecting the rights of marginalised population groups. Moreover, it not only lays out legal principles and regulations but also outlines forms of dispute resolution. Its implementation is facilitated considerably by the fact that Tanzania already has existing local institutions. However, successful implementation of the new law requires that administration units and communities are provided with the necessary information and ideas on how to initialise the process. This IIED Issue Paper contains a list of questions about the Village Land Act with the corresponding answers, designed to inform the district administrations. Furthermore, the introduction also discusses the most relevant flaws of the new law. Source: Community-based land tenure management: Questions and answers about Tanzania’s new Village Land Act, 1999. Liz Alden Wily. IIED 2003. 59p. “Protect adequate and appropriate space, limit all non-climate stresses, and use active adaptive management and strategy testing“: these phrases describe three categories of recommendations on how to integrate climate change into environmental protection strategies. Today’s climate models predict an additional global temperature rise of 1.0 – 5.8°C, and new research results recently published in Nature speak of the extinction of 15 – 37% of all species currently living in the regions examined. Climate change thus represents an additional burden on valuable ecosystems and confronts protected area managers with new challenges: not unlike insurance experts, they will need to be able to assess risks on the basis of various uncertain model predictions in order to develop adequate conservation strategies. This calls for close collaboration with regional research institutions who have the know-how and capacity to calculate and interpret climate models. Buying time presents a list of threats that the most important biomes (forest and freshwater ecosystems, grasslands, and others) will have to cope with in future. Furthermore, the report uses concrete examples to illustrate how resilience in ecosystems can be increased with the help of various adaptation strategies. > Buying Time: A User’s Manual for Building Resistance and Resilience to Climate Change in Natural Systems. L.J.Hansen, J.L. Biringer, and J.R. Hoffman (eds.). 2003. WWF. 244p. > Extinction risk from climate change. Chris D. Thomas et al. In: Nature Vol. 427 / 8 January 2004, p.145- 148. Over the past century, milk production has become the most important source of income for 600,000 small-scale farmers in Kenya. They have increased productivity to nearly double the African average. In West Africa, small-scale cotton production has grown at a rapid pace during the past 40 years, and the eastern and southern regions of Africa have seen a significant increase in the production of maize. These success stories bear hope for a continent where two thirds of the population live on agriculture, while per capita agricultural production has been on the decrease for the past 40 years. An international conference in Pretoria brought together high-ranking politicians, researchers, and representatives of farmers’ organisations, the private sector, and development agencies to discuss the conditions and reasons that made these success stories possible. The conference participants agreed that African agriculture needs to be more strongly promoted. Along with the commitment of the African governments, this requires strong farmers’ organisations and sustainable financial support for research and training. As long as agricultural production is not increased, poverty reduction in Africa remains in the realm of wishful thinking. Partnerships between local communities and forestry firms: A win-win situation? A liberalised market can be a source of great opportunity for those (ideally, local communities) who know how to preserve or acquire the rights to manage or own forest resources. Even if international competition and inadequate social and environmental investment present certain obstacles on the path to success, these partnerships with forestry firms offer local communities the chance to earn additional incom, to acquire potential investments and training opportunities. Growing international pressure on operators for greater social responsibility places rural stakeholders in a better position to negotiate more favourable terms than in the past. The report “Forestry Partnerships: From raw deals to mutual gains?’’, based on 57 case studies, examines various types of partnerships, associated problems and success stories: from outgrower schemes to the large-scale farmer with a timber concession from a small-holder. These real experiences provide a wealth of information for those planning to embark on such partnership schemes. Initial partnership arrangements are seldom ideal. However, the clear definition of an equitable governance structure, formalised by contracts, may be the start of a partnership that is destined to develop successfully. Organic farming: A recipe for success? Cotton production in Kyrgyzstan collapsed totally after the downfall of the Soviet Union. 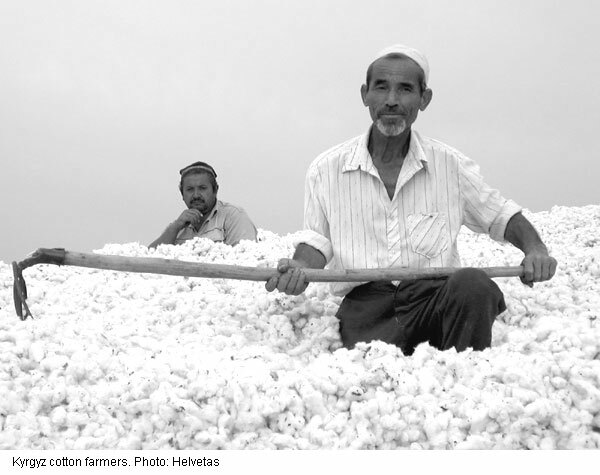 Now Helvetas, a Swiss NGO, has launched a project to promote organic production among Kyrgyz cotton farmers. Many Kyrgyz farmers only began cultivating their own land after the country gained its independence. Most of them cannot afford expensive mineral fertilizer and pesticides. This is one of the reasons why Helvetas considers organic production an economically viable solution. However, the main reason is the growing demand for ecologically produced cotton in the industrialised countries. Helvetas expects that higher profits from certified products will compensate for smaller yields. Organic production comprises the entire crop rotation cycle, which means that the shift to organic cultivation must take place for all crops grown on the cotton fields. Consequently, yields will decrease for all crops, not only for cotton. Organic markets will thus have to be developed for other products in addition to cotton. However, the greatest challenge will be to convince farmers that organic production is a sustainable strategy for the future – a difficulty the project director is well aware of. Nonetheless, he is convinced that it can be overcome and that organic production will eventually generate the value added that will enable Kyrgyz agriculture to compete with neighbouring China. “Access to Global Online Research in Agriculture (AGORA) is an initiative to provide free or low-cost access to major scientific journals in agriculture and related biological, environmental and social sciences to public institutions in developing countries. Led by the Food and Agriculture Organization of the United Nations, the goal of AGORA is to increase the quality and effectiveness of agricultural research, education and training in low-income countries, and in turn, to improve food security. Launched in October 2003, AGORA provides access to over 400 journals from the world's leading academic publishers. The founding publishers of the AGORA Journal Collection are: Blackwell Publishing, CABI Publishing, Elsevier, Kluwer Academic Publishers, Lippincott, Williams & Wilkins, Nature Publishing Group, Oxford University Press, Springer-Verlag, and John Wiley & Sons. Additional publishers will be invited to participate in AGORA. New knowledge is needed to understand the challenges of global change and the associated negative impacts on nature, society, economy, and culture. New approaches and measures must be developed to mitigate these negative effects and foster sustainable development. Researchers, decision-makers and stakeholders both from the South and from Switzerland met in joint workshops and identified the most important problems of sustainable development for eight regions of the world, ranging from South America to Africa to Central and Southeast Asia. In the context of mountains and highlands, for example, the most substantial problems proved to be poverty and the insecurity of livelihoods, along with a lack of adequate infrastructure and management forms. This combination of core problems reoccurs in all analysed regions with mountain areas. Is it a coincidence that certain core problems occur simultaneously in different regions, or are such patterns based on typical processes that follow the same scheme, no matter where? Successful identification and description of these underlying processes could provide a basic prerequisite for mutual learning among different regions of the world and for joint development of solutions to core problems. The results published in this book provided the starting point for the NCCR North-South, a transdisciplinary research programme based on collaboration between researchers from the South and from Switzerland. Cassava production in Africa has increased substantially over the past decades. In a recent article, researchers of the International Institute of Tropical Agriculture (IITA) in Nigeria highlight past achievements and point out the great potential of this crop plant. According to the authors, cassava already fulfils several functions as a food staple, a cash crop for urban consumption, a famine reserve, an industrial raw material, and an export product generating foreign exchange. The future holds many possibilities for the enhancement of cassava production. New breeds can help to promote cultivation outside the humid tropics, enable better consumer targeting, and increase the plant’s protein content. Efforts in disease and pest control will be continued. Progress in product development, marketing and trade will contribute to the economic success of cassava production, while research can support this development by becoming more market-oriented. This article provides an interesting overview. Whether cassava really is a “pacesetter of African rural development“, as the title suggests, remains to be questioned.